Here's the original request for permission and reply to release this version ..
Hi there F1Driver I'm working on another version of your Suzuka conversion. Do I have permission to release it? I'll give everyone who worked on all previous versions full credit. I have asked TTTTT too but his last post was in February here so don't know if he'll reply. Have asked Mini and he said .. I'd advise you to do your utmost to contact/email TTTTT and F1Driver because i had minimal input/work on the last release and therefore it wouldn't be best for me to give blanket permission on the track when TTTTT did most of the editing. For what's its worth you have my permission but please try to get hold of TTTTT before proceeding. I appreciate you asking for permission, and I know that its been hard to get a hold of TTTTT lately. I will give you permission to release your new version, as long as you fulfil what you promised in regards to the credits. I am not in a position to grant permission for modifying this track. If you want to modify it and release it you'll have to ask TTTTT or F1Driver. If you use any of the work from this EOAA version well you have my permission but I'd (Rich_A) like credit in the read me and a mention of www.eoaa.org. Here's Frank's reply to my request for permission. If you want to contact me regarding this track, send an email to ra@eoaa.org. What's new, well where to start. New terrain for asphalt, new textures all over and better scaling of textures too, new sky texture and lighting in gdb matches sky texture (please make sure there are no sky.dds files in GameDataLocations), bollards added, shadows optimised (full shadows can be used without taking many frames), hundreds of new trees, new track sounds (go here and download Ambient sounds V1.00 http://forum.eoaa.org/index.php?topic=282.0), fixed rolling start green light location, pit has 28 unique pit slots so you could in theory have 28 drivers pit at the same time which means PitGroup = 1 can be used in rfm. 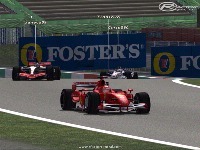 not the best variant of this track... if it aint broke why oh why try to fix it.. this is the first ever bad review i have given here, but i was looking forward to this track, and it was a letdown.. sorry to be so harsh..
Splash screen says "Original work by Geoff Grammond and Microsoft"
of the Grand Prix series and Microprose was the label released them, not Microsoft. ever released for the PC.